Land ho! 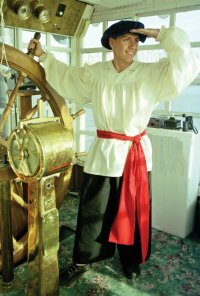 Steering the ship into port or out to sea, you're a fyne dressed steersman in our Drop Yoke Shirt, Black Trews, and Red Cotton Sash. Our optional Flat Cap is sold separately (see "Related Item(s)" below). Machine wash, tumble dry. Our Drop Yoke Shirt is made of cotton muslin and features elastic cuffs. Machine wash. Choose your size (M, L, XL, XXL, or XXXL) and color preference from among White, Natural, and Black. Our Trews are made of black cotton with a drawstring waist, side-slit pockets, and feature tie-off cuffs. Choose M (30 Waist), L (40 Waist), or XL (50 Waist). Machine Wash, tumble dry. To finish your outfit, we also include our red cotton sash. Shown: Drop Yoke Shirt in White, Trews in Black, our red sash, and our optional Flat Cap in Black.